Studied at SUNY Empire State College. "United States Public Records, 1970-2009," database, FamilySearch (https://familysearch.org/ark:/61903/1:1:K5L6-3B6 : 22 May 2014), Russell E Reynolds, Residence, Webster, New York, United States; a third party aggregator of publicly available information. Russell E. Reynolds was born perhaps about 1935. Tracy Reynolds was born perhaps about 1958. Tracy Reynolds is online at https://www.facebook.com/tracyk49. Ellery Bicknell Crane, a class="ext" href="http://books.google.com/books?id=ByzhgLUOIRIC" Historic Homes and Institutions and Genealogical and Personal Memoirs of Worcester County, Massachusetts, /aThe Lewis Publishing Company, (1907) , Vol. 3, p. 192. 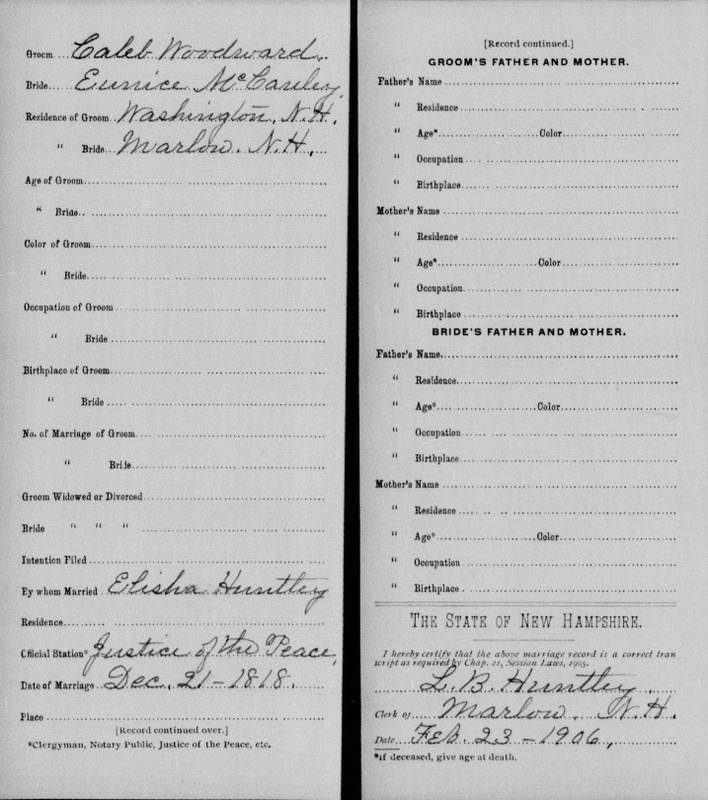 "New Hampshire, Marriage Records, 1637-1947," index and images, FamilySearch (https://familysearch.org/pal:/MM9.1.1/FLXK-P5P : accessed 09 May 2014), Caleb Woodward and Eunice Mccauley, 21 Dec 1818; citing , Bureau of Vital Records and Health Statistics, Concord; FHL microfilm 1001320. 1900 United States. Census Office. 12th census, 1900 population census schedules, Washington, District of Columbia: Bureau of the Census Micro-Film Laboratory, ([197-]) , MASSACHUSETTS > MIDDLESEX > 6-WD NEWTON, Series: T623 Roll: 664 Page: 87. 1900 United States. Census Office. 12th census, 1900 population census schedules, Washington, District of Columbia: Bureau of the Census Micro-Film Laboratory, ([197-]) , Census Place: Newton Ward 6, Middlesex, Massachusetts; Roll: 664; Page: 7A; Enumeration District: 0908; FHL microfilm: 1240664. She was the daughter of George Marshall Rice and Fannie Jane Thurston. living at Otter Creek, Eau Claire County, Wisconsin. 1900 United States. Census Office. 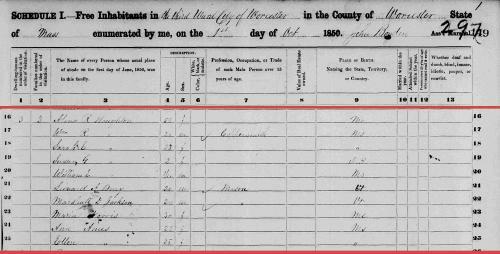 12th census, 1900 population census schedules, Washington, District of Columbia: Bureau of the Census Micro-Film Laboratory, ([197-]) , Census Place: Otter Creek, Eau Claire, Wisconsin; Roll: T623 1788; Page: 1B. 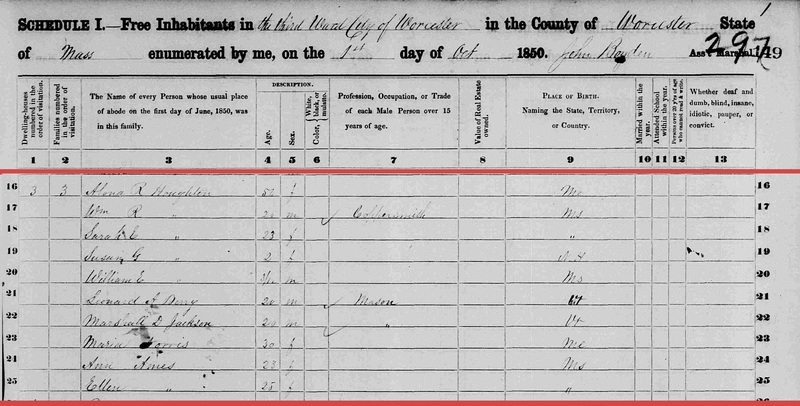 "Wisconsin, County Marriages, 1836-1911," database, FamilySearch (https://familysearch.org/ark:/61903/1:1:XRJL-84R : 3 June 2016), Charles W. Hale and Alice Richards, 09 Nov 1898; citing , Eau Claire, Wisconsin, United States, Wisconsin Historical Society, Madison; FHL microfilm 1,266,971. 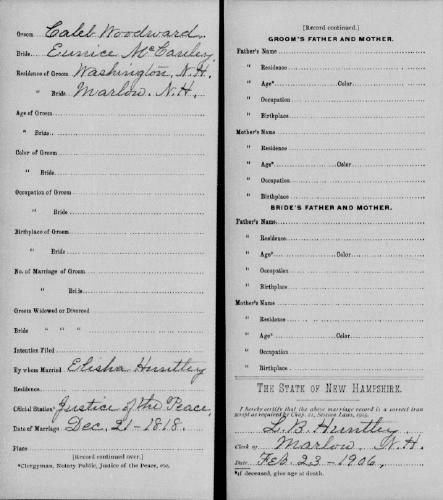 "United States Census, 1850," index and images, FamilySearch (https://familysearch.org/pal:/MM9.1.1/MD94-XBY : accessed 25 February 2015), Alona R Houghton, Worcester, ward 3, Worcester, Massachusetts, United States; citing family 3, NARA microfilm publication M432 (Washington, D.C.: National Archives and Records Administration, n.d.). Winthrop (Maine). Town Clerk, Town and vital records, 1772-1890, Salt Lake City: Filmed by the Genealogical Society of Utah, (1953) , Batch number: M503202, Source Call No. 0012299. Unknown author, History of Winthrop, Maine (n.p. : n.pub., unknown publish date), p. 426. "Massachusetts Births and Christenings, 1639-1915," database, FamilySearch (https://familysearch.org/ark:/61903/1:1:FC2W-N68 : 4 December 2014), William Richards Houghton, 23 Jun 1824; citing NEWBURYPORT,ESSEX,MASSACHUSETTS, ; FHL microfilm 0874030 IT 1-2. "Massachusetts Births and Christenings, 1639-1915," database, FamilySearch (https://familysearch.org/ark:/61903/1:1:FC2W-682 : 4 December 2014), Josiah Merrill Houghton, 24 Jul 1828; citing NEWBURYPORT,ESSEX,MASSACHUSETTS, ; FHL microfilm 0874030 IT 1-2.